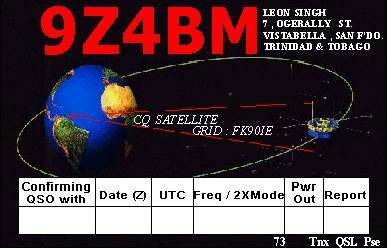 My satelite card was designed by myself using Wb8rcr Qsl Maker. 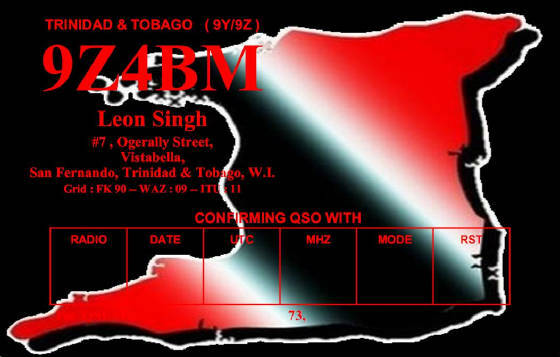 Click on Qsl Card to go his website. 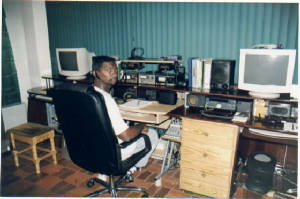 Hi to all.My name is Leon ,I was born on 5th August 1970 (so you can check my age).I was born and live in the island of Trinidad .I started this website in late 2004 and I will be continuously adding to this site as I go along in in Ham radio.I started in cb radio at the age of 17.Two years after I was introduced to Ham but still loved dxing on 11 meters.I love the world of Ham radio,I have been a licensed Ham since 1996.I started building yagis back in my days of CB radio in order to save money .I tried many different designs from operators that I talked to. After getting into Ham radio and got into computers and antenna software ,I started designing and building antennas for HF then evetually onto 6m,2m,70cm. 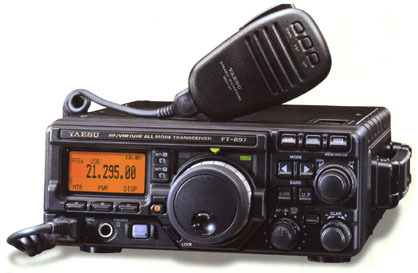 I am always reading up and researching different types of antennas from books I have and especially from the internet......The key to a great station is your antenna system. I am also into Emergency Communications...Check out what our Emcomms group has been up to !! Click on this to go to my next site !! 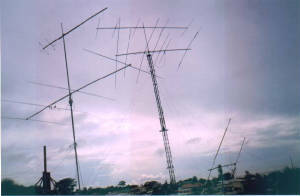 I hope this website would provide some with info on building or just ideas on antennas or just email me if you are interested in information on how I built my antennas. 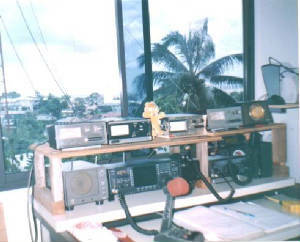 I have a lot of ideas and welcome ideas from others, also any help would be appreciated since I am tring to develop a station where any Hams coming to Trinidad can visit and use the equipment on hopefully all bands. It takes a lot of time and money but homebrewing saves a bundle. 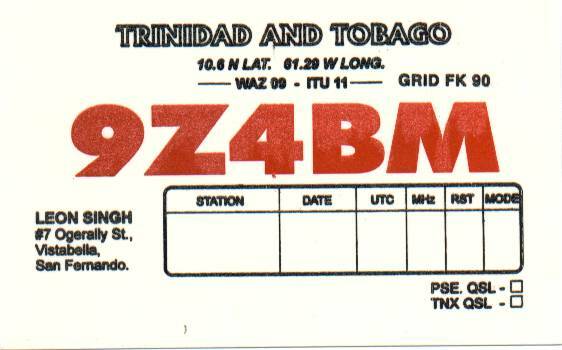 For all those interested in visiting or just want to know about Trinidad, please click on the photo below, there is some good info about our Telecomm division and coming through customs in relation to Ham radio. On my LINKS page there is a link to goto our Telecomm Division website...You can download the form needed to apply for a reciprocal license, as well as their Mailing address/Email/Phone number info is also there. If you are coming to Trinidad or just thinking of doing so, My Brother-in-law has a mini-bus that seats 1-8 people. 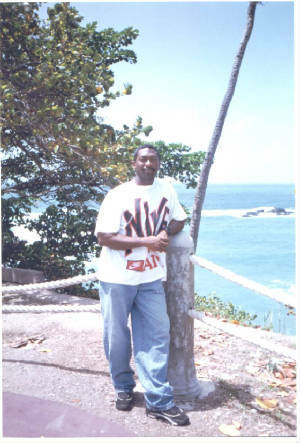 You can can call him to arrange transportation.Phone # 1-868-799-4238. 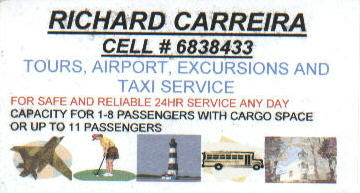 His Call Card below. 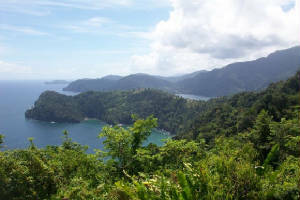 Please get in touch with me if any comments or reactions to my site.